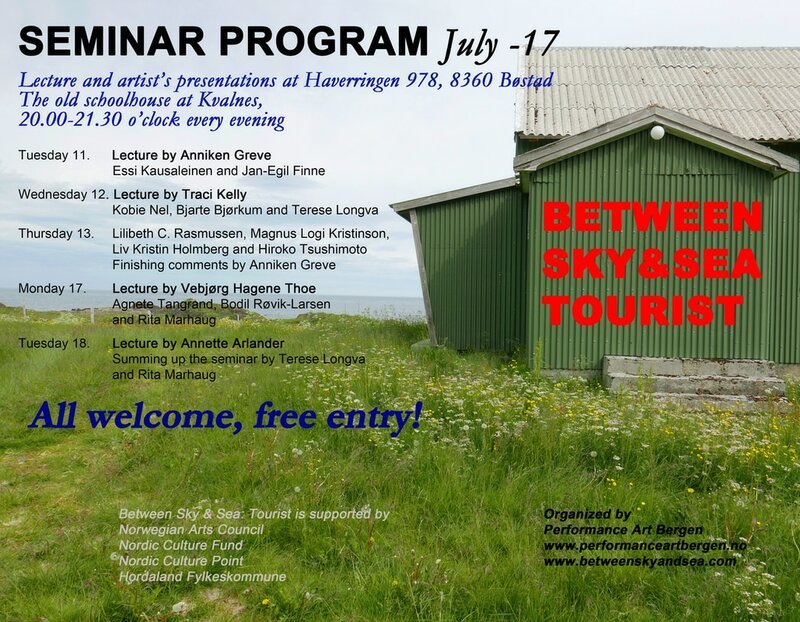 Performance Art Bergen is happy to announce our next BETWEEN SKY & SEA event in 2017. Between 9th and 19th of July 2017 we will host a production-camp for a selection of a group of international artists at Vestvågøy in Lofoten, Norway. Scroll down for more detailed information on the eminar program. ​Se lenger nede for mer dtaljert info om seminarprogrammet. The aim with this fifth edition of the format called Between Sky & Sea is to provide professional (performance) artists with a production frame, in which they can challenge our perceptions of geography, identity and politics, in a broader sense. Over a period of nine days, the artists will be provided with the means necessary for in-depth work within their art fields. The leitmotif, or backdrop against which they will work, is the growing field the tourist is occupying in our culture. In addition to individual works and professional meetings during the stay, Between Sky & Sea V will also result in a new PABLISH book. The participants are invited to contribute both texts and images to this publication. In the last decades, urbanization of the Norwegian society as well as the international community is affecting our time. This trend ranges from everything from the individual’s metropolitan quest for diversity and self-expression to labor immigration from rural areas in poorer countries. People travel to the affluent parts of the world, often to cities in need of labor in lower services such as cleaning and transportation. At the same time, the cities’ magnetic effect on the modern population is threatening smaller, peripheral communities in different ways. Ideas of inheritance or predestined residency no longer determine the vantage point from which young people perceive themselves. The prospect of becoming a fisherman, a farmer or an industrial worker in the local company is being challenged by new ideas of modernity and mobility. As a result, young people are leaving the rural areas, at the same time as local, traditional industry is threatened by global market forces, entailing constant discussions of closing down and flagging out. Still, half of the Norwegian population and more or less half of the world’s population are living in rural areas, at a distance from the major cities. Both nationally and internationally, one could claim that these places are responsible for maintaining the world’s production of goods. Without energy supply, food and construction materials from more or less peripheral, the realization of the urban dream would never be possible. Lofoten (also known as the Lofoten Islands) can be tied to the tensions between the traditional and modern way of life. In the last decade in Norway, Lofoten has been the locus of a conflict concerning political and economic values. Extraction of oil and gas threatens fishing and agriculture; new technologies and the modernization of society are at odds with traditionalism. And this conflict is far from being solved. How does modern art production reflect this antagonism? To what extent do younger and older generations perceive this classic dichotomy similarly or differently? Are these value systems mere oppositions or threats to one another, or is it possible to bridge the two? It is this context a discussion of the figure or concept of THE TOURIST becomes relevant. Tourism is a term that often functions as a bridge or buffer zone between traditional and modern society, enriching both: the tourist (the modern subject) travels to the outskirts of civilization to experience nature and cultural landscapes. Or she prefers to spend the weekend in the big city, as a welcome distraction from life in suburbia or the countryside. Art and tourism share a long and common history. Some will even claim that it was the artists in the early 19th century who paved the way for or helped develop the foundations of tourism as a phenomenon. We only need to mention the Norwegian artist J. C. Dahl to point out the connection between art production and the rise of the tourist industry on the Norwegian west coast. Tourism can also be seen as a continuum, or potentially a break with, the historical period of colonialism. From a Norwegian point of view, tourism is also linked to the discoverer, more precisely to the masculine polar pioneer and mountain climber. What was once the privileged pleasure of the upper-classes, has today become an activity for most people. Perhaps this is the reason why we rarely find artists who take on the role of the tourist. Explicit use of the tourist’s rhetoric is hardly found in art, and rather associated with kitsch. Moreover, we look to scientific figures like the anthropologist or the social scientist as a point of entry into the semantically laden landscape inhabited by the term TOURIST. Connections to previous power strategies and today’s vulgar charter tourism are some of the conditions, which make it challenging on a structural level for art or artists to embrace the concept of tourism. Lofoten has a unique and characteristic landscape, with cultural roots going back to the Stone Age in regards to both Norwegian and Sámi culture. 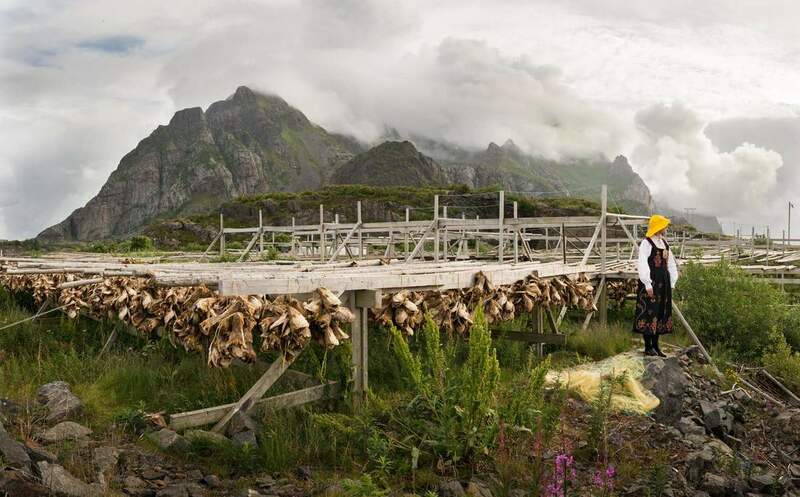 Dating back to the 1200th century, we have written documentation of Norway’s main export venture, which originated in Lofoten and continued up until the 20th century: the production of dried, salted cod and stockfish. These products are still in high demand and represent as the main industry in the six island communities that make out Lofoten. In 1984, the first modern cruise ship arrived in Buksnesfjorden in the community of Vestvågøy. Since then, the tourist industry has experienced explosive growth. Norwegian and foreign tourists visit newer and older fisherman housings (so-called rorbus) throughout the short and hectic summer season. Many drive their mobile homes all the way from Germany to go fishing, while Italians, who actually import 80 % of the area’s stockfish, come to experience the exact place of origin of this culinary product―a trade dating back to 1432. This years’ tourist season was so overwhelming that it made many issue warnings on behalf of the local communities: too many guests need housing. An estimate of one million visitors entails challenges on several levels, from accommodations to the heavy wear and tear of this vulnerable landscape and nature. Lofoten has also sheltered artists and art production throughout the last hundred years. The area has a rich supply of art and cultural activities, grounded in several professional art communities. Svolvær has The Northern Norwegian Art Center (Nordnorsk kultursenter), in Kabelvåg we find Nordland Film and Art School (Nordland kunst og filmfagskole), in Stamsund The Stamsund International Theater Festival (Stamsund internasjonale teaterfestival) takes place, here we also find Gallery2, run by artists Vebjørg Hagene Thoe and Scott Thoe. Just outside of the community center Leknes in Vestvågøy there is a studio community with its own artist-in-residence-program, called Kunstkvarteret. This residency plays an active role during the summer season. In Vestvågøy, we also find landlords and artists Anne Katrine Dolven and Kjetil Berge, who spend time there for both work and leisure. Vestvågøy connects to Hurtigruten (in Stamsund) and to the airport of Leknes (with departure to Bodø). Furthermost west in Lofoten, at Skomvær Lighthouse, the artist Elin Vister has established Røst AiR. With this as a backdrop, Performance Art Bergen (PAB) invites eight artists to take part in BETWEEN SKY & SEA V: TURIST on Vestvågøy in Lofoten within the duration of nine days. In addition to this, the group has two organizers, one kitchen assistant, two photographers and two guest lecturers, a total of 15 people. We will arrive at Leknes airport, Vestvågøy, on Sunday 9 July, with departure Wednesday 19 July. We will stay at Kleivan, a 35 kilometer drive from the airport on the northern part of the island. This is one kilometer from the village Kvalnes. From here there is nine kilometers to the closest grocery store and a ten-minute drive to Borg Viking Museum. Each invited participant will at an early stage of the stay present their platform, defining their own motivations and expectations. The two guest lecturers will be spread out during the stay. The working days will be structured around three fixed meals: breakfast at 9:00 a.m., lunch at 2:00 p.m. and dinner at 8:00 p.m. Conversations and presentations will be held in connection to the meals, while each day will be summed up with a “what happened today” session. The group will have two rental cars at their disposal. The immediate surroundings are full of potential, from the ocean to the mountain peaks. These are Røst, Værøy, Moskenes, Flakstad, Vestvågøy, Vågan and Hadsel.